Are you unsure of the knowledge you've acquired so far? Now testing your own skills and intelligence is right there at your fingertips. Try these IQ testing apps from Play Store for Android and deliver an outstanding performance in the upcoming tests with flying scores. To get ourselves ready for the show everyday, we all are geared up to enhance our knowledge and capabilities. IQ (Intelligence Quotient) testing have been prevalent for ages as those test results are considered as the deciding factor for the growth of an individual. The importance of such tests are increasing day by day where the life is all about getting through the tough competitions. Today when apps are everywhere helping us out in every little thing, it is no wonder that they will help us out with self-improvement tools. While I was looking for one such app to make my kid prepared for an upcoming competitive test, a number of such apps appeared in the search result, and I felt like testing them all. But that needs a lot of time and patience, which I am falling short of, so I thought of going ahead with those few that scored a minimum of 4 star rating if not five. The IQ Test - Cryptex Challenge is a free game from Bubble quiz games which entertains the mind with a pack of 60 unique riddles that are further divided into 5 levels with increasing difficult questions. The general survey report says that 90% of the population are able to cross the first level while only 5% can reach up to the 5th one. There are totally a number of 60 unique puzzles. There are 5 levels of riddles with increasing complications. You get 120 hints for the questions. There is even an IQ measurement tool. The app gives you a detailed statistics of your result which helps you in concentrating on your weaker sections. Each riddle will have 2 hints. But their usage would lower the value of their IQ. I found the app to be quite apt for brain teasing games, word games, mind games, puzzles, and for logical thinking. It undoubtedly increases the mental capacity and instigates children to learn more to cross the five levels. 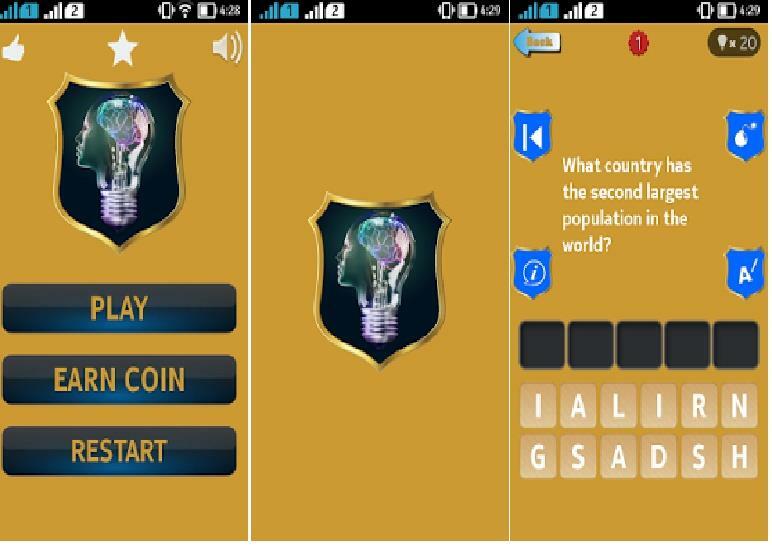 This IQ test Application from Flutter Technologies is primarily a preparatory app which has been developed with the purpose of preparing candidates to appear for different competitive examinations or competitions. The app has an excellent collection of carefully chosen questions from different fields. It even gives comprehensive explanations along with tips and suggestions on how to solve various kinds of problems to help improve one's lateral-thinking capacity. 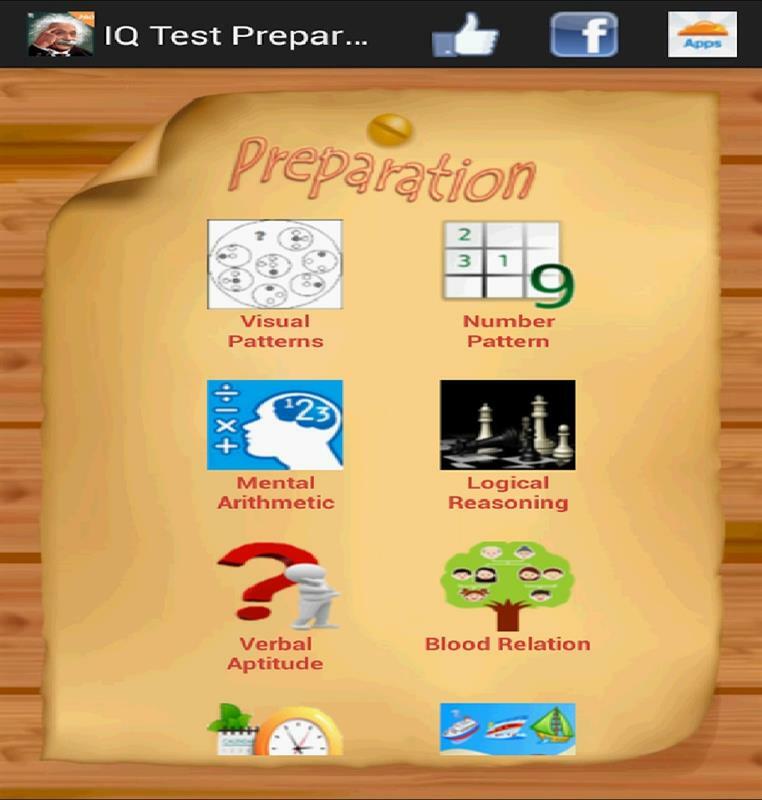 This "IQ test preparation" app has a good number of questions to test the level of preparation taken for a particular examination. There are sets of 5, 10 and 20 minutes test. The IQ and aptitude related categories of this app includes tests on Numbers, Visual Patterns, and Alphabetical sequence. It has included questions that includes topics of Logical reasoning, Verbal Aptitude, Mental Arithmetic and so on. The app even has problems on Time and date, Speed, Age, Relationship, Profit & Loss and many more. This particular app is ideally programmed for entrance level tests in school, college and university with a great emphasis on the improvement of mental health. 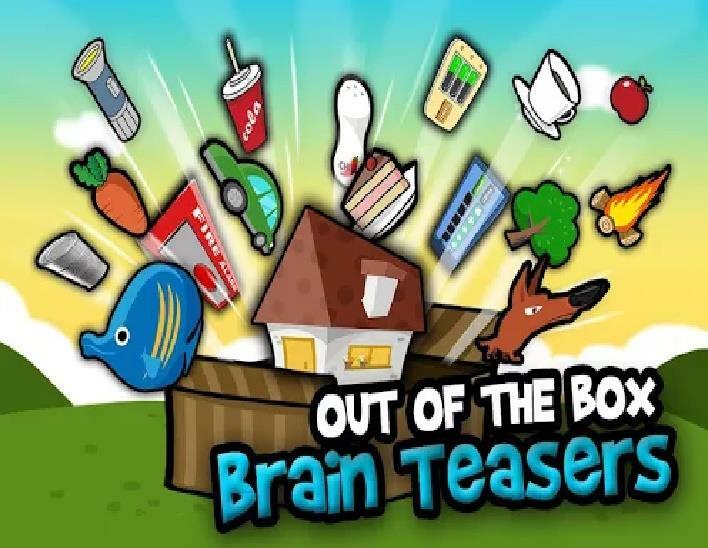 This is yet another free brain training app from mr.mobaile that contains those entertaining ladder quizzes that tests one's general knowledge quiz acumen. It is consistent of every topic on the planet and you are introduced to the world of knowledge from in-numerous fields of events and topics. With every level, the questions get tougher and the app throws an intoxicating challenge to reach the top of the ladder and being able to answer most of them. There are more than 100 riddles cleverly created. There is a hint system for fun to push forward the game a little. One can Share the results in social media sites like Facebook, Twitter, Google Plus if they have succeeded in climbing up the top of the ladder. The interface is easy to use because of its Sleek and clean design. 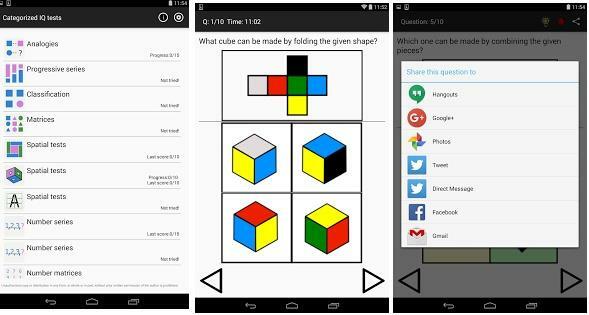 For those who are preparing themselves for tests like MENSA or DAT, this IQ and Aptitude Test Practice app from LangiS is surely going to work for you. But even if you are curious about your self assessment and want to improve your knowledge, skills, and presence of mind, by solving these short puzzles, you would be pursuing a great mental exercise, and increase your potential of numerical and spatial abilities, inductive and logical reasoning and general knowledge. Though there are Hints and solutions to most of the questions, the usage of these hints would cut down on your performance level. Once you are done with a test, you will receive an IQ score based purely on your performance. In this app the IQ score is a calculation which is based on the deviation of your score in comparison to the average score acquired by other users. Here each and every standard of deviation would be counted with a set of 15 units score of IQ. What's My IQ is a whole new puzzle game from Orangenos Studios that is stuffed with a lengthy series of creative puzzles, whose solutions are simply absurd which won't cross anybody's mind naturally apart from those who are exceptionally intelligent and have a tendency to think out-of-the-box. I found this really amazing and a very entertaining stuff with a lot of entertainment value supercharged with exclusivity and creativity. The answers given as a hint are totally out of the box which can't be guessed with a straight line of thought. When you are on the move or just hanging out with friends and family, these apps can provide you a quality time spending option. But moreover I see these apps to be one of the best ways to utilize your spare time with a spree of self-improvement. Even as a tool for preparation of exams or job interview, these apps can simply boost up your self-confidence maintaining confidentiality. One need not be embarrassed with their lack of knowledge any more, and these apps would make you ready to face the world in minutes. I tried to find flaws with them but till now I couldn't.